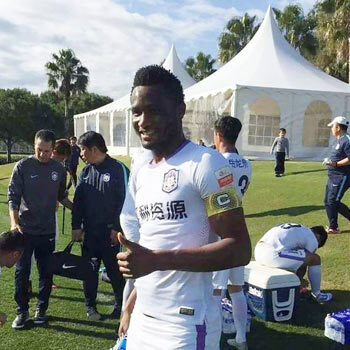 Nigeria’s Super Eagles captain, John Obi Mikel has completed his move from China’s Tianjin Teda to English Championship side, Middlesborough after passing a medical on Tuesday. Mikel, a two-time English Premier League winner is expected to join his new team-mates this morning after spending the past two years in the Chinese Super League. Even with a year left in his contract with the Chinese team, the Nigerian captain was not ready for life in the lower league in the Far East, reason he parted ways with Teda on mutual consent. Roma of Italy, Wolfsburg of Germany and Turkey’s Fenerbahce were the three other European teams that showed interest in the midfielder who spent over a decade at Stamford Bridge. Mikel, who is believed to have relished a return to England because his wife and two young children were based there will be part of a Tony Pulis side looking to bring Premier League football back to the Riverside next season. Boro currently sits fifth in the Championship table and seven points off leaders, Leeds. They will be hosts to Newport County on Saturday in their fourth round FA Cup clash before travelling to promotion rivals, West Brom on February 2. Although Middlesbrough is not short of central midfielders, Pulis believes the physical, imposing and experienced Mikel would further strengthen that department.